Arrive in Lima, where you will be transferred to your 5-star hotel. You will start the day with a city tour beginning with a visit to the Plaza Mayor, official center of the city and the original site upon which Lima was founded. You will visit the historic Cathedral an architectural masterpiece. From the Cathedral, you will walk past the Presidential Palace where the soldiers guarding the palace offer an excellent photo opportunity, and on to the Church of San Francisco and its library and collection of fine paintings and frescoes. After your trip to the historic center, you will be driven through modern Lima to visit the residential districts of Miraflores and San Isidro. After you have finished in the historic center, you will be driven across Lima to the Larco Museum where the extensive private collection of pre-Inca ceramics is considered to be the largest of its kind in the world. It showcases remarkable chronological galleries providing an excellent overview on 3,000 years of development of Peruvian Pre-Columbian History. For an unforgettable experience, Larco is one of the few museums in the world where visitors can also choose to enter the storage area with its 45,000 classified archaeological objects. Lunch at Amoramar restaurant: it adds a personal twist onto classic Peruvian marine cuisine dishes. Located in a beautifully restored republican mansion from the 1900’s, this fine establishment – found in the Barranco district – also boasts a lovely, minimalist patio and bar. Guests are invited to enjoy relaxing meals beneath the trees with fine service and a variety of exciting seafood options. Tonight, dinner is at Huaca Pucllana restaurant, overlooking the illuminated ruins at Huaca Pucllana, this sophisticated establishment serves a skillfully rendered array of contemporary Peruvian dishes. Upon arrival in Cusco, you will be met and transferred to your restaurant for lunch. Lunch at Calle de Medio restaurant: a sprawling restaurant and lounge with Jaime Pesaque’s signature cuisine and pisco infusions lined up behind the bar. One lengthy side of the 2nd level, corner spot looks over the Plaza de Armas. The menu features dishes like trout ceviche and glazed pancetta with figs and aji panca over quinoa. Transfer to the Sacred Valley of the Incas: it was undoubtedly a key area of settlement to the Incas. Its agreeable climate and fertile plains make a rare fruitful combination for the high Andes. It was also the route to the jungle and therefore an area with access to the fruits and plants of the tropical lowlands. The Sacred Valley served as a buffer zone, protecting Cusco from incursions of the Antis, the fierce jungle tribes who from time to time raided the highlands. Today the Sacred Valley remains a lush agricultural region supplying the city of Cusco with much of its produce such as maize, fruits and vegetables. Visit Awanacancha center on route: where South American Cameloids (members of the camel family) – Llamas, Alpacas, Guanacos, and Vicunas – are bred. You will learn about the renowned fibers created from their coats, as well as the ancient weaving techniques which are still used. Located down a rough, unpaved road about 10km off the main road to Maras, are the Salineras de Maras, pools on the mountainside that have been used for centuries to collect salt. A saline underground stream reaches the surface and is diverted into hundres of pools which are then sealed off and through the process of evaporation, leave the salt. Each pool is owned by a separate family who collect the salt for personal use and to sell. The hundreds of white terraces along the mountainside juxtaposed with the green of the hillside foliage and the blue sky creates a unique panorama. Continue with the visit of Moray, a very different Inca site, only about 7km beyond Maras and was a creative agricultural experimentation center. Created in the form of concentric circles atop terraces at different elevations, each circle was the growing bed of various new or different crop strains. Because the geographical position of Moray is unique, the temperature of the different terraces can vary significantly, featuring a range of climatic conditions with a very small acreage area. The Incas took advantage of these conditions to plant and moderate different crop strains and how they performed. This is a visit to the magical and inspiring world of Quechua highlanders, in which we learn how traditional people live today in the Andean countryside. We participate in the daily activities of this place that they call the village of beautiful flowers, visiting the kitchens to see a colorful variety of local foods on display, under preparation, and being cooked upon wood-fired mud-brick stoves. Then, after a short walk with our village companions to the accompaniment of flutes and drums, we enter the heart of the Andean agricultural cycle -- as vital today as it was in Inca times -- as our Quechua hosts show us how they hand-turn the soil on the mountainsides, and invite us to join them in blessing their earth, their animals, and the new-plowed land. Lunch at Rancho Wayra with a Peruvian Paso Horse Exhibition. You will witness a spectacular equestrian exhibition. The Paso horses will amaze you with their graceful gait and impress you with their elegant look, prancing to the rhythm of live Marinara music, played and danced by a group of first-rate artists. As you enjoy your appetizers and drinks, the dishes you’ve received on your table —local tamales, anticucho kebabs, roast lechon (sucking pork) and baby chicken and salmon trout baked with local herbs, to be then served at your table, cooked to your taste, with abundant house salad made with products from our organic garden. This service provides a fun and casual experience. You will savor a selection of the choicest cuts of beef, pork, chicken and rainbow trout. These will be grilled over hot coals and served with native potatoes, together with the best cold meats, vegetables, delicate sauces and fresh salads. This pleasant event concludes with delicious pastries. This morning visit Ollantaytambo Fortress: constructed of large rose-colored granite blocks so tightly set one against the other without mortar that even today a sheet of paper cannot slip into the joints. These enormous blocks were stacked sideways and upward, creating massive terraces, ending at the top of a peak. Below the fortress lies a complete Incan town, also called Ollantaytambo, which is still inhabited and maintains its original architecture and site layout, despite the weathering centuries. After the excursion, walking transfer to the train station to board the train Vistadome to Machu Picchu. Once onboard, the maître will invite you to a brunch and gourmet lunch. Return by train with a gourmet dinner, drinks, and live music! Accompanied by your guide, explore the city's ruins, and feel its pulse as you visualize the lives of the priests, craftsmen, and servants who inhabited this seemingly uninhabitable citadel. Excavations at the site have revealed skeletons, artifacts and woolen clothing, but no gold. The same precision of assembled stones exists here as in other Incan sites. 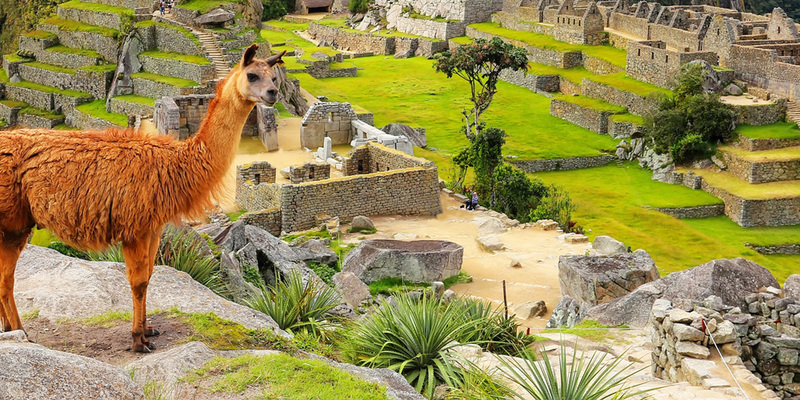 Overlooking the raging Urubamba River and discovered in a hidden tangle of vines and trees atop the mountain, the city of Machu Picchu will forever hold its secret of its destruction, the Incas left no written record . In the afternoon you will bus down the hill until you arrive at Aguas Calientes town. This morning, enjoy a second visit to Machu Picchu with the possibility to hike the Huayna Picchu Mountain. The trek leads to a view point overlooking the Inca citadel of Machu Picchu. The trail loops around the very top of the mountain, where architectural vestiges such as altars, narrow staircases tunnels and terraces can be found. Buffet lunch at Tinkuy restaurant: Sanctuary lodge hotel. Deluxe Train Hiram Bingham: the dinner is included on board. This morning you will discover Cusco by a city tour that includes the Cathedral on the Plaza de Armas, considered to be one of the most beautiful churches in the Americas. Its construction was influenced by the great Spanish cathedrals of the era, reflecting Gothic, Renaissance and Baroque styles. Another ornate church is Santo Domingo, a 16th-century Dominican church and convent built on the foundations of the Koricancha, the Incas' principal religious building. Next you explore the well-preserved ruins of Sacsayhuaman, a testament to Incan architectural skill. Compiled of massive stones, the walls were cut and placed together with incredible precision and without a sinle drop of mortar to hold them in place. This ancient fortress, where the greatest battle between the Spanish and Incas took place, overlooks the red-tiled roofs of Cusco and the spectacular lush countryside. Afternoon at leisure. Tonight, enjoy a farewell dinner at the fabled MAP Cafée. With a varied and select house menu, showcases the flavors, products and customs of our country, giving it a character which reflects the vibrancy of modern Peru. All of the regions of Peru featured in the Museum exhibits are also represented in the Museum Café’s menu, demonstrating that Peru is indeed an extraordinary gastronomic destination. Transfer to Cusco’s airport for the flight to Lima. Arrive at Lima’s airport and one of A&K’s representatives will be assisting you for your international flight.